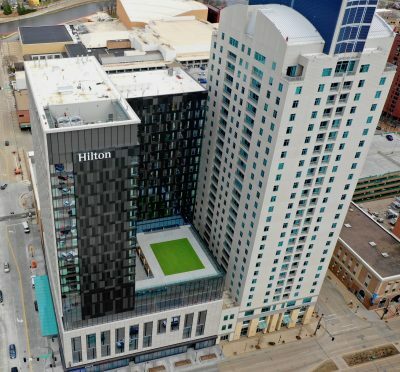 With the upcoming opening of the Hilton Downtown Rochester, Titan Development & Investments will be providing a new lodging and entertainment option in downtown Rochester. Can you provide some insight into this project? The Hilton Rochester was developed by Titan Development & Investments and Harbor Bay Real Estate Advisors after recognizing the need for high end luxury hotel accommodations to satisfy the travelers coming to Rochester for medical, educational, or business reasons. In addition to the Hilton’s modern design, there are numerous amenities including a rooftop terrace on the fifth floor, fitness center, indoor pool, sauna, steam room, and spa. There is also a private car service and skyway access to Mayo Clinic and downtown businesses. Onsite dining options will provide a variety of choices for the local market and visitors from a savory breakfast at Benedict’s to an amazing steak at Pittsburgh Blue Steakhouse. The high-tech conference center is being leased by J.Powers, and it features two ballrooms with spectacular city views. There is also a breakout area with flexible configurations and a rooftop terrace. With the recent expansion of the Mayo Civic Center, Rochester is seeking to become more competitive as a regional meeting and event center. How do you feel about the potential of that side of the lodging market? We are thrilled with the opportunities that the Mayo Civic Center expansion is bringing to the community. Avra Hospitality is managing the Hilton, DoubleTree by Hilton, and Hilton Garden Inn, which are all in close proximity to the Mayo Civic Center with convenient skyway access. With the extreme focus on delivering incredible service and superb amenities, we feel that the three hotels will be top choices for attendees. Within the DMC district this year, there will be nine ribbon cuttings, including the Hilton hotel. What excites you about the future growth of Rochester? Mayo Clinic’s growth is creating remarkable opportunities for the city and it is thrilling to see that numerous firms believe in the vision and want to be part of it. We are proud to be involved with the recent transformation and look forward to the future growth of Rochester. What does the future look like for Titan? Are there any new projects on the horizon? The last five years have been incredible for Titan with successful projects within Rochester and throughout the country. It’s an exciting time as Hilton will open mid-April and The Maven on Broadway will open in July. We are partnering with the Opus Group on The Maven which is an upscale multifamily mixed-use project in the core of the city. It has superior amenities including green roof space, swimming pool, club room, and fitness center. We have several more local and national projects that are planned as well that we aren’t ready to announce yet.